2017 may be over, but the advice, insights, and info in our top articles from last year are still current and useful in 2018! 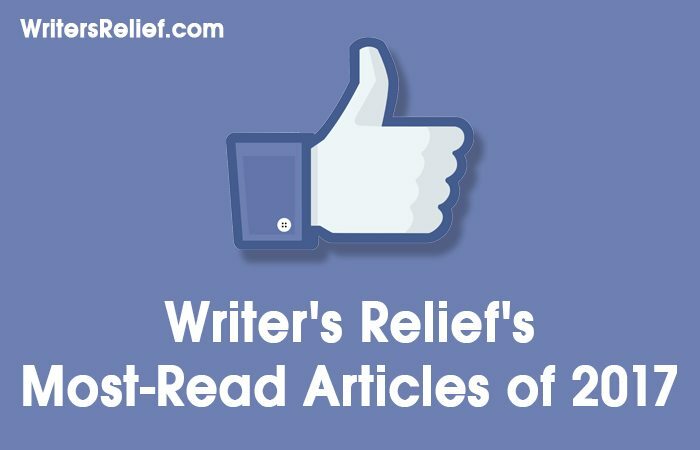 Writer’s Relief articles included insider tips on what poetry editors love to publish, a handy cheat sheet of common proofreading marks, the legal ramifications of being a writer, and much more. And articles on WebDesignRelief.com and SelfPublishingRelief.com kept our readers updated on the latest trends in social media, offered guidance for publishing in an online world, and presented easy-to-follow instructions on how to improve your website. Our blog on Medium has over 8,000 followers and continues to reach new readers every week. And our social media audience has grown to over 210,000 followers, fans, and friends! Have you checked out our super-popular Pinterest boards? Plus, now we’re on Instagram! Don’t miss any of the great upcoming articles we have in store for 2018—sign up for our free weekly newsletter, Submit Write Now! Our latest updates and info will be delivered right to your inbox!